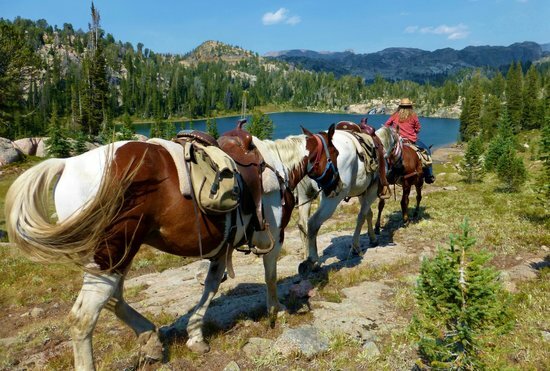 Having worked in Yellowstone National Park as a wildlife filmmaker for the past 30 years, owners Jeff and Karen Hogan know where to go when they want to get off the beaten path, and know which well worn, very beaten paths are just too spectacular to be missed. 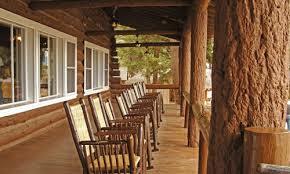 This guide shares where we take our friends and families during thier time at the cabins. Since we usually have a wide variety of ages visiting, we have honed in on the places pretty accessible for all generations, not more than an 1 1/2 hours drive from the cabin, and just a hop and a skip off the main road. This lake is so special, you should plan on spending at least two hours in and about its banks. Three miles past the Soda Butte Trailhead, look for a small parking area on the right. Even though it's a short walk to the lake, you will feel like you are miles away from everything. Once you arrive at the Lake, follow the path east to where the creek feeds into the lake. Mid June to late July the cutthroat and rainbow trout are spawning, and enter into a mating frenzy. For a comic look at this event, check out Jeff's Yellowstone Wild film for National Geographic in the video library at the cabin. Playful ottters are sure to bring a big smile to your face. In trout lake they can be found fishing, wrestling, spinning sprials, and eating tasty cutthroat on the logs nearby. Don't forget to look up; Osprey overhead put on a show with wild acrobatics before they dive into the lake to snag a tasty trout. If you enjoy fishing, bring the rod! Trout Lake is a hotspot for good sized rainbow or cutthroat trout. Have little ones that need to get out of the car and run? 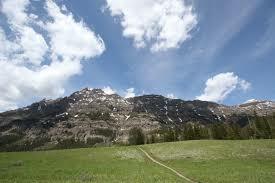 The wide open fields below Barronette Peak make a perfect outdoor playing field. Just look for the signpost for Barronette Peak and park on the pullout alongside the road. You will need a spotting scope or a good pair of binoculars for this jaunt. Up on the cliff's edges is where mountain goats and big horn sheep can be seen jumping about dangerously on the cliff ledges. It's a fun treasure hunt, because the scattered bits of snow look just like the white fur of the goats and sheep. I highly recommend grabbing a scope or a strong pair of binoculars for your time in Yellowstone. Wildlife Along the Rockies is a photo gallery two blocks east of the cabin. Scroll down to the bottom of the page on the website below for their phone number. Their Nikon scopes rent for $30/day. In the winter Barronette makes for an easy 3.5 mile XC ski trail. 189 feet elevation gain/loss. Trailheads are located at the upper and lower Soda Butte bridges. Trail: Short 2 mile loop. Not suitable for very small children. 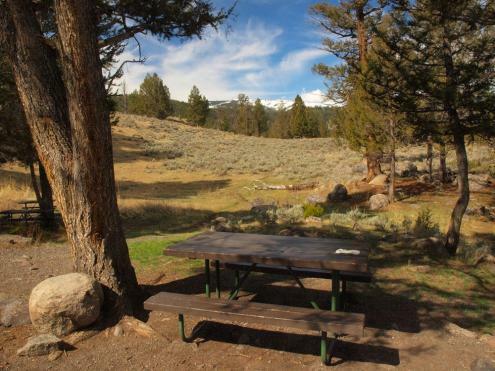 This a perfect spot for a shady picnic and a short stroll that offers spectacular views in all directions. For family outings, it's one of our favorites. From the picnic area continue on the ridge beyond the Yellowstone River bridge going east from Tower Junction. 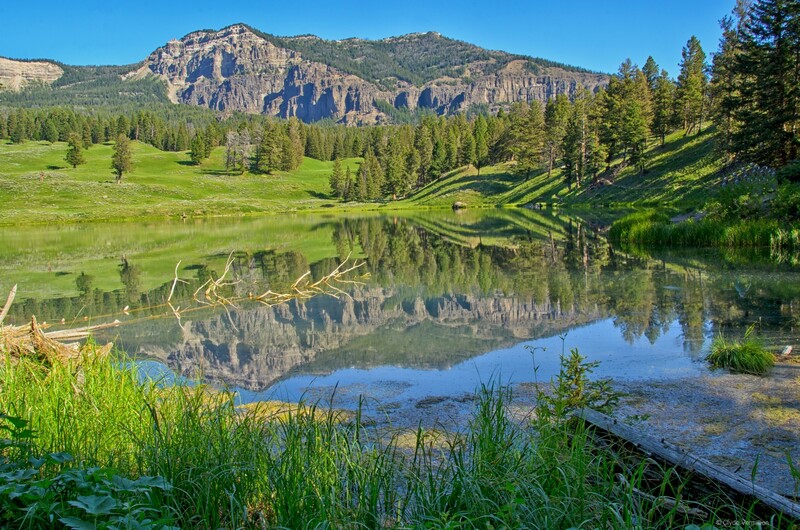 We don't go very far before taking the short loop back to the parking lot, but you see beautiful flowers, great views into the canyon and of the river plus close range views of the basalt columns above the Yellowstone River. 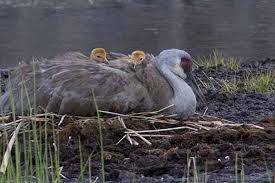 While this is a good family outing, portions of the trail follow cliff edges so keep a close eye on the little ones. For wildlife, we've seen mule deer, big horn sheep, and black bear, so please your bear spray. Buns-N-Beds in Cooke City is the place to get your picnic lunch. Very savory, generously sized sandwiches. We recommend renting bear spray becuase it saves on unnessesary waste. Click here to rent bear spray by the day or week at Canyon Visitor Center. Hint: Turn left at the handpainted sign mounted on an old wagon on the left side of the road that reads "Horse Rides"
Escape the waits in Yellowstone and take an authentic Rocky Mountain horseback ride in the Bearthooth Wildnerness. Not your typical nose-to-tail ride, even those who I've had to prod to join have been amazed at the experience. You'll cross the beautiful Clarks Fork river, meander through meadows, and navigate scenery so spectacular it's hard to keep your hands off the camera and on the reigns. Skyline has strong, gentle horses fit for riders of all ages and abilities. Rides range $30 for an hour up to $130 for 1/2 day with lunch. To Get There: From Tower Junction turn right over Dunraven Pass to Canyon Junction, where Norris Canyon Road and Grand Loop Road meet. Stop at the Canyon visitor center to check out Jeff's film Yellowstone: Land to Life made for the education center. Then, drive 2.2 miles south and turn left onto South Rim Drive. Proceed another 1.6 miles to the parking area at the end of the road. Yeah, it really looks like that. 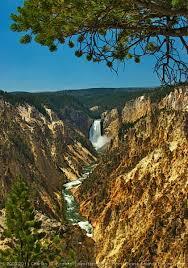 This is one of those Yellowstone not-to-be-missed iconic views. Yes, it's busy. Yes, do it anyway. Here we spot osprey, ravens, swallows, and bald eagles, which nest along the canyon wall. Even with the naked eye it is easy to see why Artist Point has been one of Yellowstone’s most popular vista points for over a century. Want to hypnotize a child? Guide them through a maze of glippity gloppity splattering mud. Mud comes to life in this hike, and the addition of brightly colored geothermal features makes for the stuff of dreams. May or June is best, when the higher moisture content makes things really splattery. 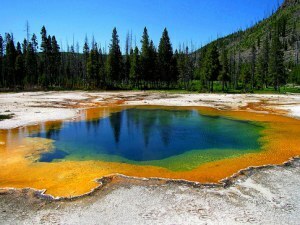 This hike appeals to all the senses: the sound of the mud is both funny and soothing, the sulfuric smell of the geothermal features makes for great jokes, and the steamy, colorful fumeroles are so beautifully out of place. You'll have to drag the kids away from this one. We love grabbing a drink from the general store next to Roosevelt Lodge and enjoying it on the shady porch of the lodge in a gigantic rocking chair. A great stop as you make your way back to the cabin from a long day in the park. Sandhill cranes have built themselves a little nest out in the middle of this lake, and in the springtime you can almost alway find a nesting pair of cranes. In March or April you may catch their high-stepping courting dance if you are lucky. You can usually first hear them though, and thier beautiful high-pitched ratttling call means spring has finally come. Once the colts hatch, the family can be seen with your scope on the far side of the lake hunting. The best time to get a photo would be dusk, when they all come back to the island to hunker down in the safety of the island for the evening. Floating Island Lake is also a good spot to watch black bears.